The Tower of Dusk is the left-hand tower of Ghostgate as you approach from the south. This tower is the forefront of the military arm of the Tribunal Temple. It serves as the main headquarters for the Buoyant Armigers. (The only other place where they are found is at the Armigers Stronghold in Molag Mar.) Among the more notable residents are Mertis Falandas, who is the Master trainer for Spear, and one of only two Spear trainers in the game, Dronos Llervu, who offers a nearly complete selection of glass armor and other valuable armor and weapons for sale, Salyn Sarethi, of interest to both the Imperial Legion and the Thieves Guild, and Wulf, a mysterious Imperial soldier with a lucky streak. 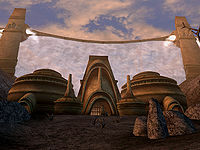 On the top section of the upper floor, look for three skill books, 36 Lessons of Vivec, Sermon 14 (Spear), Sermon 15 (Unarmored), and The Hope of the Redoran (Blunt Weapon). The unique Auriel's Shield may be found carried by one Drelyne Llenim who lives on the upper level. She is highly ranked in the Temple, so be careful how you go about relieving her of it. There are fire ferns and scathecraw growing on the upper level, but harvesting them is a crime, so it's probably not worth getting caught for. The lower level has a great many valuable treasures, but they're well guarded, so it will take a great deal of skill to steal them undetected or kill those defending them. Most obvious are the stores of glass armor in Dronos Llervu's shop. Besides the helm, cuirass, pauldrons, bracers, shield, and boots that can be found out in the open, three additional pieces can be found in one of the crates in the corner (the one in the back on the bottom; the other three just contain chitin). A glass jinkblade and glass longsword are also found here. The other treasures are more hidden. The locked door in the main room leads to a small alcove, where you may find Mertis Falandas and another locked door, the only key to which is held by Mertis. Since he is a Master trainer, you may want to avoid killing him to get it. Good Sneak skill will come in handy here. Behind this door, there is a vault with a variety of treasures, among them the artifact Amulet of Usheeja, an ebony longsword, shortsword, mace, and staff, a glass firesword, frostsword, poisonsword, stormsword, and jinkblade, and a Dwarven Shield of Wounds and Helm of Wounding, all under the watchful eye of a Buoyant Armiger. A Lucky Coin: A strange and very rare meeting at the Ghostgate.